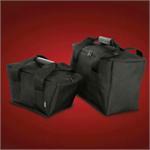 These Mesh Zippered Lid Sets attach easily using your existing Saddlebag and Trunk Lid bolts. They look great and are an absolute must for all of those small items. These Zippered Mesh Nets easily hold rain gear, covers or other items in the lid recess with a bungee net system. Package contains Zippered Mesh Nets for both both Side Luggage Bags and Rear Trunk. Very easy installation. A Torx T20 Screwdriver is required. If you do not have a Torx Screwdriver Set, pick up a T10 - T30 Set. You can do almost anything simple on your Spyder with this set.